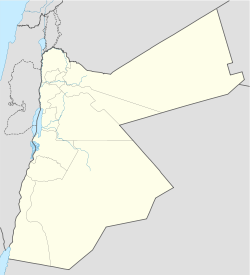 Muwaffaq Salti Air Base (Arabic قاعدة الشهيد موفق السلطي الجوية - الازرق ) is a Royal Jordanian Air Force air base located in Azraq, Zarqa Governorate. In 1918, during World War I, T.E. Lawrence (also known as Lawrence of Arabia) used the historic castle in Azraq and the plains at that site as a base for use as a landing ground for the aircraft which were supporting the column pushing north towards Syria. The main qualities of the area were its good visibility and fine weather for flying. In 1976, the area was chosen by the Royal Jordanian Air Force for a major new air base. Construction started that same year and in November, 1980, No 1 (Northrop F-5A/B Freedom Fighters) and No 11 squadrons (F-5E/F Tiger II's) were deployed there. The air base was officially opened on May 24, 1981. It was named after Lieutenant Muwaffaq Salti who died in battle with the Israeli Air Force on November 13, 1966, during the Battle of Samou. It was initially home to Nos 1 and 25 Mirage squadrons. Between 1997 and 2007 Mirage squadrons were based here. Between October 2014 and July 2015 the Belgian Air Component deployed six Lockheed Martin F-16AM Fighting Falcon's here as well under Operation Desert Falcon (later Operation Inherent Resolve) due to the military intervention against the Islamic State of Iraq and the Levant. Since 1997 No's 1 and 2 (General Dynamics F-16 Fighting Falcon) squadrons have been based there. Due to the military intervention against the Islamic State of Iraq and the Levant, the Royal Netherlands Air Force have deployed some of their General Dynamics F-16 AMLU Fighting Falcon's here along with General Dynamics F-16C Fighting Falcon's from the U.S. 20th Fighter Wing and F-16A Fighting Falcon's from the Royal Bahraini Air Force The American Government has also deployed various aircraft there due to the military intervention against the ISIL. The base is reported to host several MQ-9 Reaper drones, based on satellite imagery. The base is partly operated by the 407th Air Expeditionary Group. ^ AirForces Monthly. Stamford, Lincolnshire, England: Key Publishing Ltd. November 2014. p. 4. ^ a b AirForces Monthly. Stamford, Lincolnshire, England: Key Publishing Ltd. May 2015. p. 56. ^ "Reaper Drones Revealed to Be Operating from Jordan - bellingcat". bellingcat. Retrieved 2016-03-02. ^ "Air Force identifies airman killed by storm in Jordan". Air Force Times. December 9, 2016. ^ "USARCENT command team travels region to focus on enduring partnership". US Army. December 9, 2016. Wikimedia Commons has media related to Muwaffaq Salti Air Base. This page was last edited on 22 December 2018, at 16:59 (UTC).